The arrival is momentous, and emotions are high - for both the riders and the anxiously awaiting families and friends. It's a beautiful day at Revere Beach and the excited group of wives, husbands, girl- and boyfriends, relatives and charity supporters are wandering up and down the endless promenade asking each other and phoning the staff: WHERE will the riders actually be appearing? And then we are all ready and here they come! 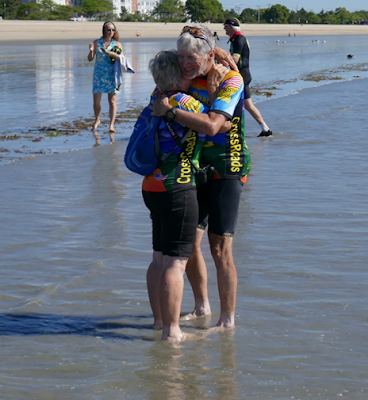 Hugs and kisses, tears and indescribable joy...and endless thanks for the safe conclusion to each rider's journey. Emil carried his bottle containing Pacific Ocean water into the Atlantic and emptied it there. In spite of his belief that this would significantly and maybe even dangerously raise the level of the Atlantic, there was no noticeable difference. Just to be sure, he filled the bottle with Atlantic water and will empty it into the Pacific at Paula's Hidden Beach when we reach the west coast in about five weeks time. Rod, Pete, Cathy and her husband Larry joined us for lunch and some of David's delicious Maine Beer. My sister Glori and her husband arrived in the early afternoon to celebrate the final evening with the CrossRoads riders. At the closing "ceremony", awards were made (some quite humourous and others very touching) and everyone received a diploma...even me for "outstanding spouse support over 3404 miles!" During the past 50 days I have spent innumerable hours SEARCHING: for the right routes, for the riders along the way, for interesting and rewarding things to do along my journey. And I have been LOST quite often, and sometimes this was just aggravating and sometimes even pretty frightening. But I have FOUND countless rewarding experiences: informative visits to museums, wonderful hikes, endless photo ops and, above all, lovely and amazing people who were delighted to spend a little time chatting with me. I've learned a lot about the fascinating country I grew up in ... and this was my own personal goal. No raise of the water level?! Maybe the water lock through the Panama has been open. No - the water level of the Pacific is down and needs some replenishment. Make sure it done within 5-6 weeks. Thank you Eve for sharing your experience with us! We wish you a safe trip back to California. Greetings from your Friends of the Nia Group in Baar.